If you have never experienced a raging inferno, chances are you do not know how to respond. What about when you hear a distinctive warning signal for an impending tornado? How do you handle an outdoor chemical cloud? If you hear loud “pops” down the hall, what will you do first? Workplaces are required to have an emergency action plan (EAP) and review it with each employee covered by the plan. How long has it been since you looked at yours? Do you conduct drills? Does your EAP contain steps relative to the continuity of operations? 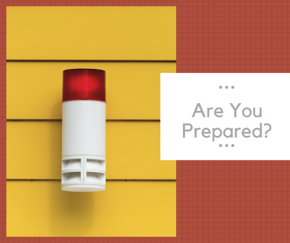 Emergencies are oftentimes hard to predict, but it is easy to prepare for them which is why staying proactive will make it less challenging. Establishing any EAP requires a risk assessment. If you conduct the assessment with an “expect the unexpected” approach, you probably will not account for every emergency situation, and that is okay. A risk assessment will allow you to understand what can happen. Once the “what” is established, then you move on to “what next?” Involving your workforce and collaborating with others (e.g. safety professionals and emergency personnel) is a great step when it comes to writing your EAP. Planning beyond what is required by regulation is an even better step. Now, your plan is written; next step is implementation. When Augustus Gloop’s mother shouted “Don’t just stand there… DO SOMETHING,” Willy Wonka replied, “Help. Police. Murder.” His nonchalant remark is one of many one-liners from the 1971 classic, but in a time of crisis—does everyone on your team know their role in an emergency? Generally, fire, medical, weather, chemical release, and violence are your top five emergency situations. Every EAP is different in terms of specifics because every facility and workforce are different. We work in offices, in plants, outdoors, in the air, and out at sea. The safety of your team matters, so how do you ensure they know the steps to follow in an emergency? How about making it a part of your onboarding process? A superb onboarding process will include steps when a new employee is hired, when a new employee starts, and periodic check-ins throughout a new employee’s first year. Does your process include reviewing steps of your EAP? How much time does it take to complete the review? Is your approach mostly cut-to-the-chase or comprehensive? Do you review it once or periodically? Your answers should be: yes, depends, comprehensive, and periodically. Your EAP was not written in a hurry, so why rush the review? The goal is to ensure the safety of your workforce, especially in an emergency. When a new employee is given a tour, point out the emergency exits, too. Walk to and point out an evacuation’s assembly area. Listen to distinctive alarms and discuss the purpose for each one. Make learning fun by being interactive. Stephen King said, “There’s no harm in hoping for the best as long as you’re prepared for the worst.” Does your EAP cover the following areas? This list is certainly not an inclusive one, but if your current plan is missing any item(s), then you may disappoint your team, or, at the very least—Stephen King. The Continuity of Operations Plan (COOP) is equally crucial because when “business as usual” is disrupted, it can cost money, so COOP helps identify key jobs and develops preventative actions to continue functions when disruption occurs. A fire may not burn essential equipment, but water used to suffocate the flames will certainly destroy equipment. Is your information stored safely enough to access with new computers? An act of violence may not physically harm the entire team, but it will certainly affect everyone. Will your surviving workforce receive PTSD counseling? A crisis is not the end of the world. It may be the end of a lifestyle, so you will adapt.